Their Situation Has Become More Dangerous:Will you stand up and speak out for the Guantanamo hunger strikers? 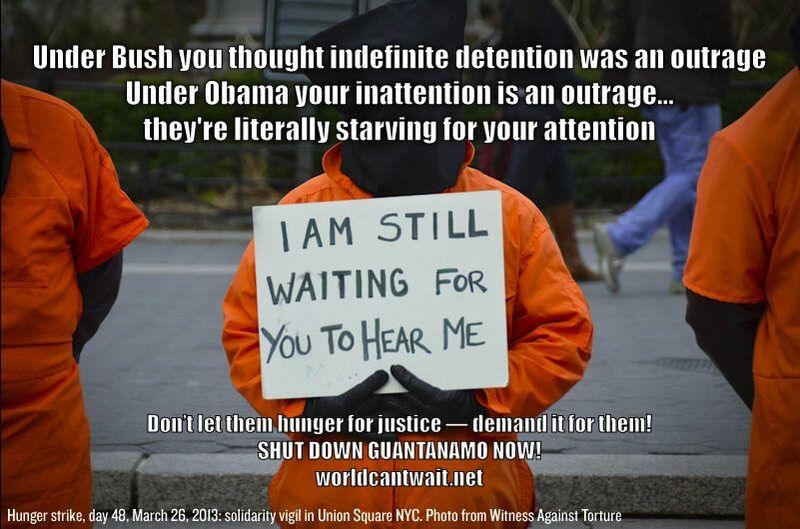 Will you stand up and speak out for the Guantanamo hunger strikers? Come for a half hour or two hours, whatever time you have. With the orange jumpsuits and black hoods that signify America’s “war on terror” torture program, join World Can’t Wait and Witness Against Torture for an action at Federal Plaza and out in the streets to raise the voices of the hunger strikers. Having you with us will make our voice – and theirs – stronger. The facts are stark. More than 100 men on a new hunger strike at Guantánamo, now in its eighth week. The context is heartbreaking. More than half of the 166 men at Guantánamo have been “Cleared for Release” by U.S. authorities. Not charged with any crime of terrorism or violence, they linger in the prison because of the Obama administration’s and Congress’s callous disregard for their basic legal and human rights. All inmates at Guantánamo – subjected to routine indignities and abuses – are waiting for real justice: their release when innocent or the chance to plead their case in a legitimate court of law. With no concrete hope of a return to their families and home countries, they choose resistance. They choose more suffering. They hunger strike. Center for Constitutional Rights staff attorney Omar Farah told the Inter-American Commission on Human Rights on March 12, 2013: “Our clients report that most of the men at the prison are now in the fifth week of a mass hunger strike to peacefully protest worsening prison conditions, religious provocation, and the crushing reality that after 11 years in indefinite detention, there is no end in sight to their suffering. In light of the humanitarian crisis unfolding at Guantánamo, it is indefensible that the U.S. government failed to answer the Commission’s simple questions about how it plans to close the prison camp.” After eleven years of detention and with conditions deteriorating, some of them have lost hope and see no other way to protest their detention and treatment than a hunger strike. Attorneys have received reports of their clients coughing up blood, being hospitalized, losing consciousness, and becoming weak and fatigued. Soon, the men on hunger strike will be risking permanent physical injury and even death. Continue to follow developments in these newsletters and on our national website, and share your actions and ideas with us! ← Call to Support Guantanamo Hunger Strikers!